Dessert cocktails are usually not my thing. Their very etymology is redundant, and quite frankly, any drink sweet enough to merit the extra designation of "dessert" may as well just go by Insulintini as far as I'm concerned. Dessert wines and dessert beers (the latter not a thing, really, but bear with me) tend to fall under that same philosophy, but in each case, I've got my much-cherished exception. For example, I love Moscato d'Asti, which is a peachy-flavored, pink-tinged, Italian sparkler that has become a hallmark of summer to me. Give me a split of Moscato and a porch on a 90-degree night and I'm completely in my cups (a phrase which, I swear to Bacchus, up until this very second I always thought meant just self-contentedly happy, but apparently it means happy via inebriation, which knowing me I can't argue against). Beer-wise, I guess I would say I'm a sucker for coffee stouts and raspberry Hefeweizens; whether or not those should be called dessert beers I'll leave up to some other blog to decide. So that brings me to La Naranja Blanca, which was invented by my cousin-in-law, Mark, and his girlfriend, Molly, during my most recent at-home cocktailing marathon (which also yielded yesterday's Income Tax Cocktail). I was kind of huddled in one corner of the kitchen experimentin' while they were cattycorner doing the same with all these coconut goodies I'd bought ages ago and never gotten around to using. 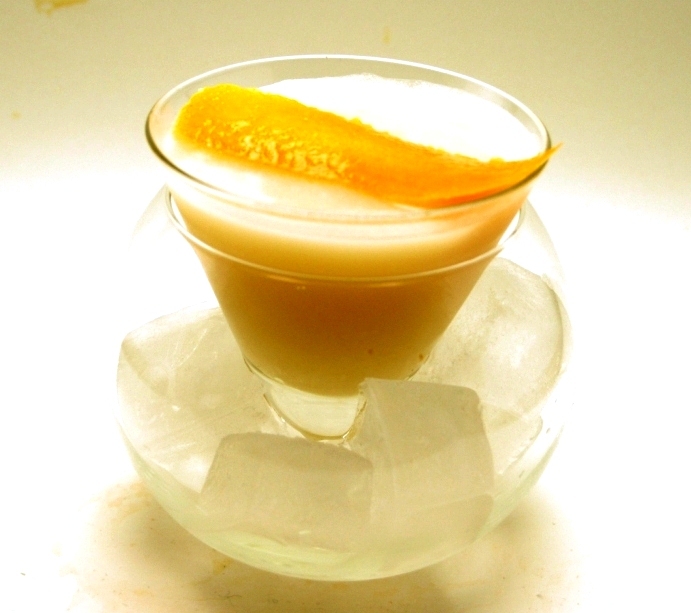 La Naranja Blanca is a dessert cocktail I can get behind because it's got a lot going on and it manages to be sweet without being sugary (always my litmus test for any potation). Try it today! Combine all ingredients in an ice-filled cocktail shaker. Shake thoroughly. Strain into chilled martini or cocktail glass. Garnish with orange peel. Info on how I made my orange-infused rum can be found here. Canned coconut products run amok in my heavily-Dominican nabe, but you can purchase Coco Lopez on Amazon, too, believe it or not. Orange blossom water, aka orange flower water, is new to my repertoire. I bought a bottle of it recently in Pittsburgh, of all places. There's a DIY recipe for orange blossom water here.